The Battle of Wagram, fought on the Marchfeld along side the Danube and not far from Vienna itself, took place on July 5-6, 1809 . 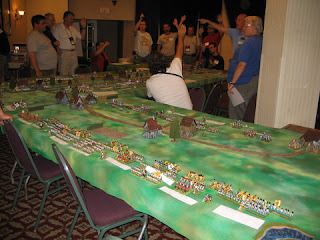 It was the largest battle to that date in the history of Europe.﻿ The Hofkriegsrat team, namely myself, Joe Fish, Barry Frandsen, Thomas Kinstler, Roger Downie, and Dan Beattie had planned and painted for the series of six 1809 games that we ran at Historicon 2009 for over a year, but this was the big event! It took all six of us working hard to set up the terrain and troops over the course of about 90 minutes. In all, we wound up with 14 players, seven on each side, which was almost ideal. The table was a "Z sort of shape, and 5 feet wide. The section running from Glinzendorf and along the Russbach height on the French Right flank was 12 feet long, the central sector running from just beyond Markgrafneusiedl and along the Russbach to Deutsch-Wagram and beyond was 11 feet long, and the sector of the French Left running from about Aderklaa to Aspern and the Danube as 13 feet long; that's 36 linear feet of 5 foot wide table in all! . Here Aspern (and the Stadler arm of the Danube) are at the lower right, and Markgrafneusiedl is at the upper mid right. We had to angle the table to fit it into even the generous space allotted at the Host! ﻿A slightly different view of the same, as Peter continues to set up troops until the last minute! ﻿﻿View from the far Northern end of the Rusbach Plateau towards Margrafneusiedl and Baumersdorf. 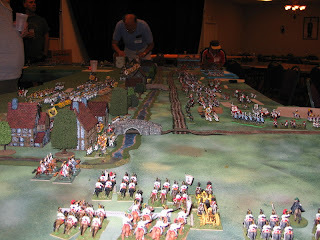 Dan Beattie helps rearrange some Austrian troops, while Andy C. contemplates the scenario. He wound up taking an Austrian command; I think he's going to need the beer! Other members of HAHGS had assisted with a monumental playtest of the game back in CT the month prior, which was both fun and excellent preparation for running the game in Lancaster. The numbers in orange indicate the number of MOVE segments required for commands from the French Reserves at Raasdorf to enter the table at that location. The sectors are for breaking this huge battle down into three component engagements, which we obviously didn't do here! We did not use the optional rule for the possible arrival of Austrian Erzherzog Johann, either. As a result of a successful "Raid on Hof" in June (run by 'Rat Joe Fish with Piquet: Les Grognards that morning at the Con), Wrede's Bavarian Division was not available, having been recalled to help deal with the uprisings in Southern Germany. The players have selected their commands, and we're about to get started, while I brief "Napoleon" (Phillip)on the Reserves (off table at start) that he has available, and the mechanism for directing them and determining when they arrive once he gives the order! 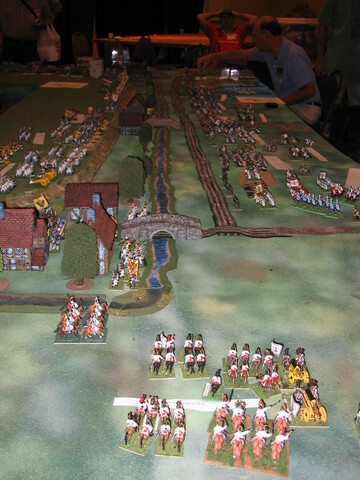 Much as happened historically, Davout (played by brothers and Piquet veterans Chris and Pat Velas) quickly moved to attack the Austrians left flank, trying to seize control of the "hinge point" of the Austrian left flank at Margrafneusiedl (seen in the foreground). The Austrian artillery on the Eastern edge of the Russbach doesn't lack for targets, either. ﻿"That's Up one for Superior Position, Up two for Point blank fire from smoothbore artillery, and Up another one for the target being in attack Column! Roll a D12 + 4 vs the target's D6." 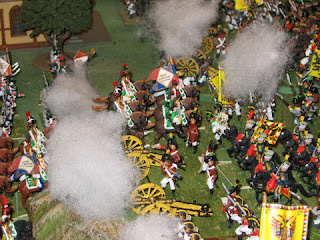 ...and decides to send in the three batteries of the Artillery a Cheval of the Imperial Guard to support Oudinot's faltering attack. ...and then draw an Artillery Firepower card - Firing as a Grand Battery, that's six shots at Point blank range from some of the finest smoothbore artillery units in the history of the world! Ouch! 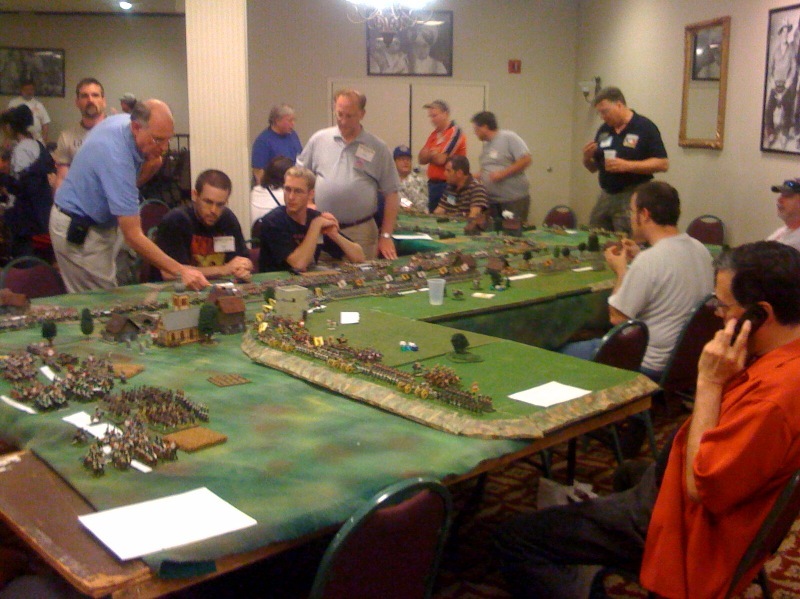 ﻿Dan Beattie presides over the action on the Southern end of the table. The Austrian players representing the Corps of Klenau (distant), Kolowrat (middle), and Liechtenstein's Reserve Grenadiers and Cuirassiers await the French attacks upon Aderklaa (mid ground) and Breitenlee (distant). The rooftops of Deutsche-Wagram are seen at the very bottom of the picture. ﻿Looking North from Aspern, Massena (near) and Bernadotte (black shirt) realize they are considerably outnumbered by the Kaiserlicks in this sector... so Massena attacks! In so doing they are hampered by Morale Point losses assessed to represent the combat they had engaged in prior to the start time of the game (circa 9AM Battlefield time), as well as being pounded by Austrian artillery from two sides. Meanwhile, Massena's audacious attack seems to be keeping the white coats paralyzed near their starting positions. 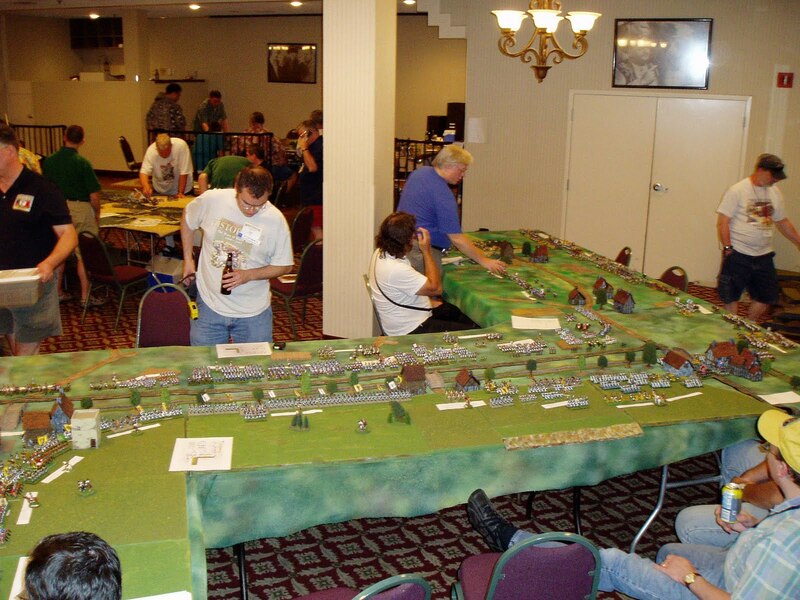 The players in this sector were all new to Piquet/Field of Battle. Liechtenstein's Reserve Corps seems content to shoot at Bernadotte with their artillery, and otherwise wait for their moment... in Reserve! In fairness, the player rolled a lot of poor Leadership dice scores on the Move cards, and thus was inclined to play it safe. 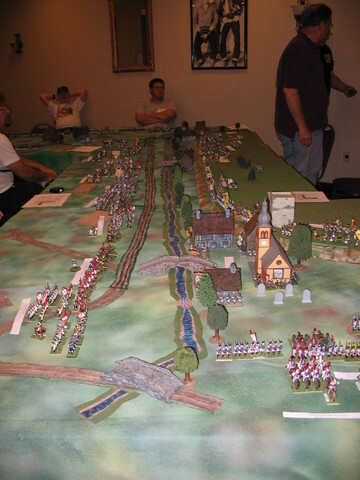 This picture is perhaps my favorite shot of the game; one like it will be on the cover of the 1809: Blunders on the Danube scenario book. ...but are unable to do so; note the large gap in the Austrian position! Heavy fighting continues around Breitenlee between Massena and Austrians Kleanau and Kolowrat; lead GM dispatches "Rats" Joe and Thomas to the sector to assist the players in keeping the game moving along. Back near Markgrafneusiedl, Nordman has run out of Morale points, and fails his Corps Morale Test when the card comes up. 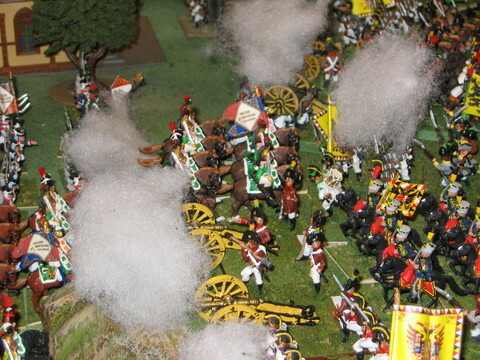 French Dragoons and Cuirassiers pour through the gap onto the Russbach Plateau. Meanwhile, the combat around Breitenlee drains Morale points from Massena, Klenau, and Kolowrat fairly equally. The defeat of Nordman is followed closely by the collapse of morale for Rosenburg's Corps, which had been holding Markgrafneusiedl; this has exposed the flank of Hohenzollern's (Andy Cowell)'s position on the Heights. Almost out of Morale points himself before the arrival of the Guard Horse Artillery, their intense bombardment plus Davout's progress breathes new life into Oudionot's Corps, and he manages to break through onto the plateau himself after seizing Baumersdorf. Bernadottes Saxons are rapidly melting away; they are out of Morale Points. Bernadotte rolls a "7" on his D10 versus a "1" on the opposing D12; he will pass at least one more Corps Morale Check before finally failing near the end of the game. In an effort to take some of the pressure off of Bernadotte, as well as pin the remainder of the main Austrian line, Mac Donald's Army of Italy moves to the attack along the Russbach as well! Fierce fighting between Mac Donald and Hohenzollern, as the Italians attempt to push the Austrian defenders back off the ridge line. Klenau is repulsing Massena's attacks; the Badeners of Legrand's Division are seen in the center. and the Imperial Guard Cavalry - Polish Light Horse, Grenadiers a Cheval, Chasseurs a Cheval, and the Empress Dragoons! Napoleon (Phillip) had dispatched all of these troops from his HQ at Raasdorf, leaving no more troops in Reserve (Wrede's Bavarians were unavailable due to being recalled to South Germany following a successful Raid near Hof by a motley collection of Brunswickers, second line Austrian troops, and perhaps even Von Schill's Hussars - the immediately prior game, fought Saturday AM at Historicon). At this point, we were out of French commanders to handle this elite force, so I asked Joe to take command... and he rolled up a "Triple Magic Move" - up to 36" onto the 5 foot wide tabletop, with immediate melee resolution. Joe and I first met at The University of Connecticut in 1973, when I was a Freshman and he was a Senior, so that's almost forty years of wargaming together off and on! Joe is a notorious beau-sabre, so I didn't have to twist his arm to command a grand charge by the finest cavalry in Europe. They are seen here after their charge has destroyed or forced back four Austrian regiments! At this point, we called the game - rolling for the outcome of the next Corps Morale Check card on each side showed that Bernadotte would finally have withdrawn his battered Saxons form the fray, after having held on long enough to allow the French to be victorious elsewhere, while both Massena and another two Austrian Corps would have failed their checks - total of 2 French and 5 Austrian Corps breaking from Morale loss. This would have left the almost pristine Imperial Guard and supports to break through around Aderklaa. Overall, it was scored a Major French Victory. As noted, we didn't use the option for possible arrival of Erzherzog Johann, in part because I hadn't figured out how to do that yet, and in part because we wouldn't have had enough troops for his force, too! The game took less than four hours to play to a conclusion, and almost every player was engaged in heavy fighting for most of the game. The players all seemed to enjoy themselves, and as a GM it was great fun seeing the drama unfold over the course of the evening. 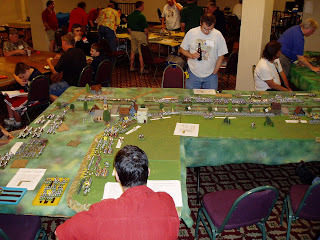 Although Wagram was a huge project, we enjoyed it tremendously, and given the megalomania inherent in being a Napoleonic Wargamer, we have an even bigger battle (in terms of figures) planned for Borodino at Historicon 2012, and a number of 1813 games including Dresden in the works for Historicon 2013. Meanwhile, we'll be running Znaim at Historicon 2011 in a few weeks; hope to see some of you there! "You can *always* roll a One!" The Austrian artillery arm didn't perform very well in the War of the Austrian Succession, and that lead to wholesale redesign of the ordnance to produce lighter guns that would be more maneuverable on the Field of Battle. In the Seven Years War, the new Austrian pieces were so admired that most other powers in Europe copied their designs; even Gribeauval had served with the Austrian artillery in the 7 years war, and was probably heavily influenced by the experience. Austrian artillerists received several years of training, and better pay than their infantry and cavalry brethren, at the price of a longer term of enlistment (14 years). By 1809, though, the once cutting edge Austrian guns had fallen somewhat behind the rest of Europe, especially the French. Austrian artillery companies (batteries) came in five types by 1809 (not including siege units). The old 3 pounder regimental guns were discontinued, but the light guns still saw some use as 3 pounder Brigade batteries, usually of eight 3 pounder guns each. In addition, Grenz units sometimes retained their attached 3 pounder guns. There were three kinds of 6 pounder batteries. First were the 6 pounder Brigade batteries, which again had eight 6 pounder guns, and were generally assigned to Infantry Brigades. Second were the 6 pounder Position (or Support) batteries, which had four guns and two 7 pound Howitzers, and were generally assigned at the Divisional level. Third were the Cavalry Batteries, newly established in 1778, which also had four 6 pounder guns (of different and lighter design) and two 7 pound howitzers. They were generally assigned to cavalry Brigades or Divisions. Finally, each Corps generally had two or three 12 pounder Position (or Support) batteries, each of four guns and two howitzers, There was no Army Artillery Reserve, as there was in the French army. With that background, we're going to proceed on a tour of the artillery and related support units of my miniature Austrian army. These are 2 Austrian Cavalry batteries; the elongated trails and the upholstered "wurst wagon" seats (on top of the ammunition cases, upon which the crew rode astride) are very distinctive. I use Limbers for my Austrian Cavalry batteries in lieu of crew to help them stand out. For that reason the drivers are wearing the brown coats faced red of the Austrian artillery; properly these would by driven by troopers of the Fuhrwesencorps, who usually worse white coats faced Emperor Yellow, although Brown coats were an option. They usually wore black/yellow/black brassards on their left upper arm as well. This organization also handled the transport wagons, and was separate from the artillery organization, which probably wasn't the best arrangement for co-operation and efficiency! The Austrian artillery carriages were famously painted yellow ochre - the colors I've used are probably a bit too bright; perhaps I'll go back some day and try staining them with a yellowish brown to dull them a bit. The metal fittings were painted black. Evidently the gun barrels were painted black as well, presumably to keep up the black and yellow Hapsburg color theme. This seems odd to me, as usually only guns with iron barrels were painted (in order to reduce rusting). One would think that paint used on bronze barrels would burn off pretty quickly once the guns were in action! In any event, my units all have guns with bronze barrels. A view of the second battery - not the somewhat different style of limber of the first gun. The drivers, limbers, and guns are all Minifigs. I have deliberately only used two horses to pull the limbers instead of the 4 to 8 that would have been used. This is to save cost and space! I only have two Cavalry batteries in my army, and would really like to add one or two more. I tried using some 25mm Old Glory guns - the pygmies you see out in front in this shot are them - look like 15mm models, don't they? Most unsatisfactory. I'd love to get my hands on some more Minifigs Cavalry guns... or even better, see Sash and Saber make them - they make an Austrian (foot) 6 lber and Howitzer, so what gives with NOT making the most easily recognizable ordnance of the entire Napoleonic Wars? Maybe someday soon? Here we have no less than four batteries of 6lber Foot guns. These are all Old Glory crews with Sash and Saber guns. By the way, evidently both the artillery and specialist units had drummers as part of their establishment; they wore the same scalloped white lace on the collars and cuffs, and the facing colored wings with scalloped lace and central rosettes as the infantry. Another view; the crew wear the traditional brown coats with red collars and cuffs of the Austrian artillery. I could have included some figures with light blue facings, representing members of the relatively unskilled Handlanger corps, whose job was primarily to assist with the movement and positioning of the guns, as opposed to the actual firing. Doubtless considerable cross performance of duties occurred in an actual battle! This next group of three batteries (all my batteries gave 2 model guns with crew) are Minifigs, both crews and guns, except for the farthest unit which has Sash and Saber guns. I think these 30 year old Minifigs stack up quite well against the Old Glory crew figures, and even the excellent Sash and Saber guns. A final view of the Minifigs units - note the water buckets hanging from the underside of the carriage on the two units farthest to the right. Here is a 12 pounder Position battery. The crew are Foundry for this unit, Sash and Saber guns. Another view; to help differentiate my 12lber batteries, they have four crew figures per stand instead of the three figures of the 6lber batteries. I also like to use a Howitzer and a 12 lber model for these units, or at least the Austrian 12 lber batteries. Two more 12 lber batteries using Old Glory Crews; the left hand unit has Sash and Saber guns, while the right hand one has old Minifigs guns. Another, closer view of the two 12 lber batteries seen in the previous shot. A final, rear view; if you look closely, you can see that some of the figures have the drag ropes coiled and carried at the rear of their jackets - the famed "bricoles"! Minifigs also made a small set of Austrian Pontoniers, which I have painted as sappers. The Sappers wore a blue-grey to blue coat (too light and neutral a shade has been used here) with red facings, and a corsehut. The uniforms of the Miners and the Engineers (all officers) were essentially the same aside from minor variations in the colors of the plumes (when worn at all). Another view, perhaps repairing (or mining!) a bridge. The pioneers, who assisted the above units with largely unskilled manpower, wore a similar uniform with grey (or less commonly, blue grey) coats with dark green facings. Finallly, the pontooniers wore ﻿a medium to dark blue uniform (this time including the pants as well) with red facings, and once again the corsehut. There was also a battalion of Danube boat handlers raised from among the Grenz; by 1809 they wore a plain shako and a medium to dark blue jacket with red facings (pointed "Hungarian" cuffs with the "bear's paw" lace) and light blue Hungarian pants, complete with the yellow/black braid and knots. A few more parting shots of some of my Austrian artillery... the lone officer is supposed to be Oberst Smola, "Father of the Austrian Artillery" of this era.